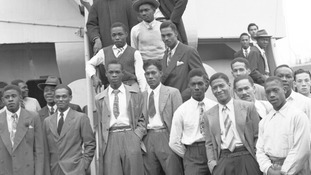 Members of the so-called Windrush Generation have been given a boost after it was confirmed the National Archives hold arrival records of thousands of people who came to the UK decades ago. Details from arrivals into the UK, including name, birth date and details of the journey taken were all recorded on passenger lists drawn up for the Board of Trade between 1878 and 1960. These records, which are filed in nearly 1,500 boxes at the National Archives, could include those who came to Britain from the Caribbean by ship. Many of those in the Windrush generation lack these records, having never applied for British citizenship or passports, and are now struggling to prove they are here legally. However, it has emerged that thousands of landing card slips recording the arrival of Windrush-era immigrants were destroyed by the Home Office in 2009. These records could help those looking to support claims of their arrival on British shores. It comes as more stories from those affected by the issue have come to light. Albert Thompson - not his real name - was initially denied vital radiotherapy for his prostate cancer unless he could produce the right citizenship documentation. The 63-year-old, who was born in Jamaica, has been the focus of much coverage during the current Windrush generation row. Theresa May assured MPs Mr Thomson would be "be receiving the treatment he needs" when his case was raised by Jeremy Corbyn at Prime Minister's Questions on Wednesday. And he has now been given a date to attend hospital. But Mr Thompson told ITV News the ordeal left him angry and worried for his health. "I'm angry about the situation but it's all on the inside because I should have been getting this treatment over and done with," he said. The Government is to make compensation payments to members of the Windrush generation who suffered as a result of official challenges to their migration status. Downing Street declined to give details of the compensation scheme, saying only they would be announced "shortly" by the Home Office. It is thought likely that payments will go beyond the reimbursement of legal bills and include a recognition of the anxiety caused to long-standing Commonwealth residents of the UK whose right to be in the country was questioned.